The Wings & Wheels event is held in the rolling parkland at Henham, near Southwold, Suffolk, the ancestral home of the Rous family, and organised for charity by the Halesworth Lions Club. A temporary grass strip is marked out in a clearing, the rear of which is tree lined and gives a wonderful backdrop for the proceedings. The air display content for the event was small, but one team was making its public debut in new colours for 2010, a great coup for this small event. Phil Whalley reports for UK Airshow Review. 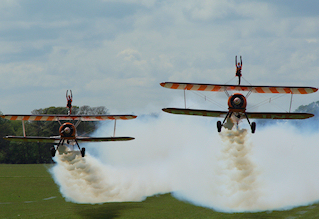 Aerosuperbatics had enjoyed several years of sponsorship by the cosmetic brand Guinot for their ever popular wingwalking display team, but knew that the deal ran out at the end of 2009. For much of last year there had been little news forthcoming for any continued backing to take the team through to the 2010 season, and there seemed a real risk that we might have seen the last of the girls in their Lycra outfits atop the brightly painted Stearmans. Thankfully, as was announced in November, Breitling have stepped in to back the team for the next two years. The Breitling Wingwalkers were supported for the short flying display by Nigel Willson in his Yak52 and the Swift Aerobatic Display team, all of which gloried in what had become a lovely sunny day. The event is also a fly-in, with a multitude of light aircraft arriving during the morning. Sadly the numbers were dented by the early bad weather which included heavy rain and low cloud, which made the conditions of the afternoon quite incredible in comparison. There was still 51 aircraft on the ground by the time the display commenced at 2pm, including some lovely vintage types, various micro-lights and an autogyro. Henham Park is a beautiful location to hold an event of this kind, and once the weather played ball it really made for a memorable experience, all the more so with the chance to see for the first time the stunning orange Stearmans of the Breitling Wingwalkers - and their equally stunning wingwalkers.